I’m delighted to be able to share today a recent and laudable accomplishment of a friend and colleague of mine, Dr. Rebecca Palacios. Becky has been working with me on the Curriculum Board at Age of Learning since 2009, helping to guide the award-winning early learning curriculum at ABCmouse.com Early Learning Academy, along with our other Curriculum Board members and teacher advisors. Becky is a pioneering educator, with a Ph.D. in Curriculum and Instruction from the University of Texas at Austin and more than three decades of experience in early childhood education. In 2014, her career in education was recognized with great honor when she was inducted into the National Teachers Hall of Fame. In other words, Becky is already an educator’s educator, at the very top of her profession. And yet she recently decided to go through the process of renewing her National Board of Professional Teaching Standards (NBPTS) certification. In 1987, I was proud to become one of the original members of the NBPTS Board of Directors, representing all U.S. pre-k and bilingual teachers. The NBPTS was established to strengthen teaching standards, professionalize the teaching workforce, and define and recognize accomplished teaching. With the other board members, I helped to establish the gold standard for teaching and learning certification throughout the nation. After serving eight years on the National Board, I went through the rigorous Early Childhood Generalist Standards certification process and became National Board Certified in 1997. In 2006, I renewed my NBPTS for the first time. The renewal process is important because it demonstrates that the teacher has voluntarily gone well beyond what is required to teach in each state and can live up to the National Board’s expression of ideals, its Five Core Propositions for Teaching. It also allowed me to stay grounded in the teaching profession and focused on the best practices in my field, and it encouraged me to reflect on the positive impacts I am making in my professional career: my connection with students, families, other teachers, and the community. For my NBPTS renewal, I was thrilled to be able to teach a lesson in the pre-k classroom of one of my former student teachers. As a member of the Age of Learning / ABCmouse.com Curriculum Board, I was additionally excited that I was able to use an ABCmouse.com book called Environments: Tropical Rainforest in my lesson. This engaging e-book provided an opportunity for me to incorporate science concepts that the students were learning, in addition to my lesson goals for vocabulary, literacy, and technology. Because the NBPTS renewal process required me to submit a Profile of Professional Growth, I was also able to highlight the professional growth experiences I have daily in working on ABCmouse.com for Age of Learning. In my long career as an educator, I’m proud to have been a founding member of the NBPTS, a former Vice Chair, a benchmarker and trainer for the Early Childhood and English as a New Language certificate—and now a Board Certified Teacher who has gone through the renewal process twice! Congratulations to Rebecca Palacios, Ph.D., lifelong educator, lifelong learner. Becky is a shining example of the talent, dedication, and expertise found among the many outstanding educators that make-up our Curriculum team. I feel lucky to have them as colleagues, but more importantly their efforts are positively affecting the lives of the millions of children who are using ABCmouse.com in classrooms, libraries, and homes. On the Age of Learning blog, we recently shared the first of what will be a series of research case studies focused on the impact of ABCmouse.com in schools and homes. This first case study examines the experience of Julie Choudhary, a 25-year-veteran kindergarten teacher in Escondido, California, using ABCmouse.com. In particular, it focuses on her classroom success using ABCmouse.com to differentiate instruction and her ability to engage the families of her students. 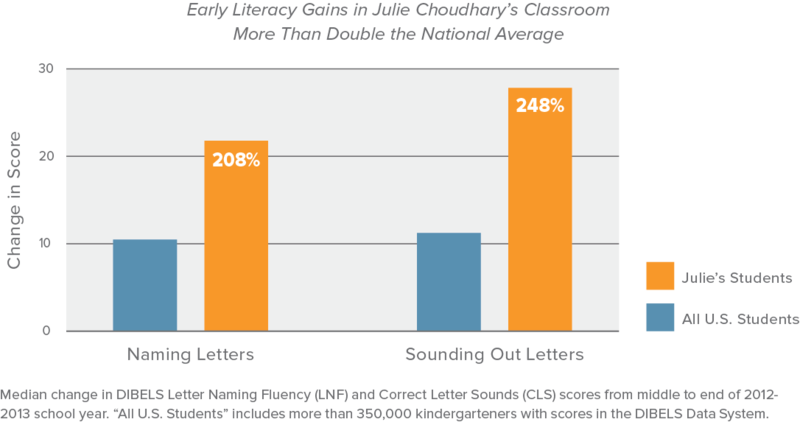 Julie found that ABCmouse.com helped her students make significant academic gains, with growth on key early literacy skills of more than twice the national average.